.. HAMANISHI Katsunori's Personal History, Collections & Demonstration Records .. This section shows summary of my short biography, main exhibitions, main collections and mezzotint demonstration records. Visiting Artist at Cleveland Art Institute, U.S.A. Worked as Exchange Artist of Japan & Canada at Windsor, Canada. Part-time Lecturer at Tamagawa University （up to 2015）. Part-time Lecturer at Yokohama College of Art （Currently）. Visiting Professor at Bradley University, Illinois, U.S.A. Member of The Japan Print Association. 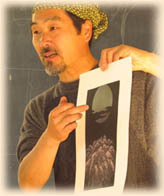 HAMAGUCHI Yozo & HAMANISHI Katsunori Joint Mezzotint EXhibition, Worcester Art Museum, Worcester, MA. 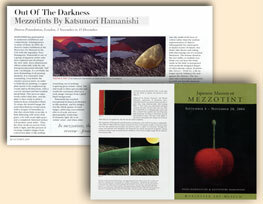 2005 "Out of The Darkness" Exhibition, London U.K.
2012 HAMAGUCHI Yozo & HAMANISHI Katsunori Joint Mezzotint EXhibition, Washinton U.S.A.
2013 Art Institute Chicago Exhibition, Chicago U.S.A.
- British International Print Biennale, U.K.
- Miami Graphic Biennial, U.S.A.